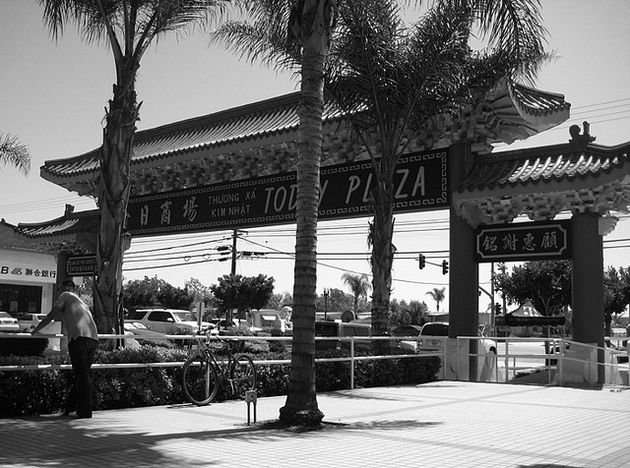 Top: Little Saigon, Westminster, Orange County. Photo by A Culinary (Photo) Journal used under a Creative Commons license. Looking at the many recent popular constructions of Orange County — television shows like Laguna Beach, Newport Harbor, The O.C. — one might be excused for seeing it as a homogenous collection of picturesque suburban beach towns. Politically, Orange County remains a symbol of staunch but diverse conservatism, ranging from strict evangelical social reformers to libertarian mavericks. However, as immigration flows changed over the course of the past few decades, Orange County’s demographics changed and with it, so did its political leanings. Today, Asian Americans account for one-fifth of Orange County; Latinos make up more than a third. Immigrants account for half the county’s population; Asians and Latinos comprise the vast majority of residents in cities like Buena Park, Fullerton, and Anaheim. 36% of Asian Americans in Orange County register as Republicans and 27% as Democrats. Vietnamese Americans, who make up nearly half of the county’s Asian American electorate, support the GOP the most staunchly: 40% align with Republicans and only 27% with the Democrats. In 2008, President Obama secured about 48% of the vote in Orange County, while Romney won the county in the 2012 election by roughly six percent. As U.S. military engagement in Vietnam increased, so too did the need for munitions and weaponry. California courted the government for military dollars like few others — this not only altered the landscape, but also politics and immigration policy. When more and more G.I.s established relationships with Asian women overseas while in service, they returned home to the U.S. and California hoping to settle down and make families. This forced changes in immigration policies, resulting in the War Bride Act of 1945 and subsequent amendments such as the Soldier Brides Act of 1946 and 1947, which addressed the issue of federal government’s long denial of naturalized citizenship to Asians not born in the U.S. The 1952 McCarren Act ended the ban on naturalized citizenship for Asians, but still set discriminatory quotas. Finally, the 1965 Hart Celler Act redefined the criteria for immigration, placing family reunification as a major plank and ending racist national quotas by replacing them with hemispheric equivalents. With the 1965 Act and America’s combined efforts in the Pacific and Asia, immigration from the region increased. The United States’ withdrawal from Vietnam brought a flood of new arrivals. Americans demonstrated a reticence toward Vietnamese refugees, though the Republican Ford Administration pushed through the 1975 Indochina Migration and Refugee Assistance Act, with Camp Pendleton in Southern California serving as one of four refugee centers. Immigration from Vietnam to the U.S. continued, spurred on by the Refugee Act of 1980; from 1980 to 2000, 531,00 Vietnamese refugees and asylum seekers came to the United States. 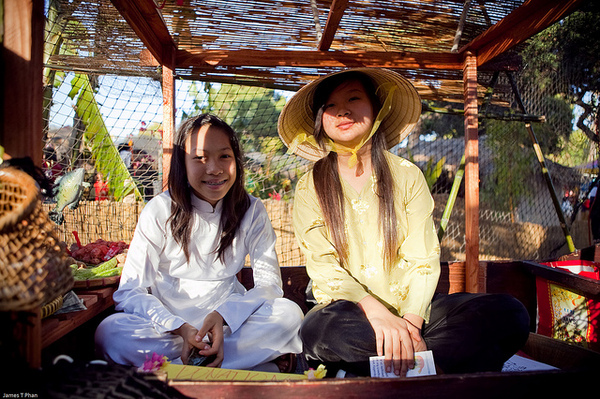 Today 40% of all Vietnamese Americans live in Orange County. Though registration has dipped since 1992 — reaching an all-time-low in 2002 before rising again due to the efforts of Vietnamese conservative activists — the Republican party continues to enjoy the support of Orange County’s Vietnamese community. Republican Tri Ta of Westminster recently became the nation’s first Vietnamese American Mayor, though he has admitted that the GOP often failed to effectively reach out to minority communities, and anti-immigration rhetoric “annoys him.” Even if fewer of Orange County’s 190,000 Vietnamese Americans identify as Republicans, nearly all of the community’s elected officials still align with the conservative party. As a refugee population, most Vietnamese lack the kind of political attachment to a party that might be important factors in communities with longer ties to the political process. But considering that most Vietnamese Americans only arrived over the last three decades, the community’s ability to secure success in electoral politics deserves attention, U.C Irvine Professor Linda Vo told KPCC in early December. In fact, Ta himself came in 1992 when the government granted his father political asylum. Nationally, as has been reported widely, Asian Americans voted for President Obama at a rate above 70%. Moreover, along with Latinos, Asian Americans voted for the Democrat in greater margins than four years earlier. This is perhaps another example of why the term “Asian American” remains problematic — Vietnamese are not Chinese, just as Germans are not French. Though declining in numbers, more Vietnamese still identify as Republicans than Democrats. Did O.C. Vietnamese Americans make up the 30% that voted for Romney? The race for the 47th Congressional District between the then 14-year incumbent Loretta Sanchez and her rival Van Tran, who became the first Vietnamese American elected to the California State Senate in 2002, demonstrates the complexity of this process. Debates about undocumented workers (Sanchez’s parents were Mexican immigrants) and human rights in Vietnam (which appealed to the district’s significant Vietnamese community) occupied center stage. Tran even used the old language of McCarthyism, suggesting Sanchez’s interactions with Ramon Castro and her voting record on economic stimulus and health care amounted to a “socialist conspiracy.” A Tran campaign flyer highlighted the Republican candidate’s “conservative beliefs and Asian values” while questioning Ms. Sanchez’s lifestyle. Ms. Sanchez won, but many viewed the battle as one indicative of California’s future — a majority minority state in which one group’s gains come at the expense of another. In 1970, according to census numbers, 1,538,000 Asians lived in the United States. The nation’s total Vietnamese population stood at 246 and most of them were students. By 1980s however, nearly 262,000 Vietnamese lived in the US and many of them disproportionately in California. From 1980 to 1990, in Los Angeles County the percentage of Asian American households grew from 4.9 to 9.3 percent. * At the turn of the new millennium, nearly 12 percent of the nation’s Asian American population resided in California. Ten years later, the U.S.’s total population of Asian Americans had reached 4,775, 070. Latino numbers expanded from 4,554, 331 to 14,013,719. In fact, from 2000 to 2010, Los Angeles, Orange, and San Diego counties all recorded declines in their white population, slight drops among African Americans, while seeing significant gains in both Asian and Latino residents. In pure numbers, Orange County includes greater numbers of Asians and Latinos when compared with San Diego. Of course, this uptick in diversity fails to guarantee interaction. For nearly all minority groups, rates of segregation from whites have stayed the same or increased. If one uses school segregation as an indication of housing patterns, the problem has only intensified in Southern California. Even with spatial segregation, Orange County’s new demographics have ways of intersecting. “To see how radically demographics have changed in Orange County, California, just look at what’s for lunch,” wrote Jennifer Medina in the New York Times in April of 2011. “Nowhere are the shifts more evident than in the abundance of ethnic restaurants with menus meant to please varied palates.” Hop Phan, owner of a Vietnamese-Mexican fusion food truck called Dos Chinos (derived from the tendency of O.C. Spanish speakers to describe all Asians as “chinos”), grew up in a Vietnamese family in a Mexican neighborhood in Santa Ana. His experience with his own family’s culinary traditions meshed with those of his Mexican American friends. Whites may not integrate, but perhaps other groups have, which considering Southern California’s history of hybridity and diversity, seems likely. When famed Vietnamese poet Nguyen Chi Thien passed away earlier this year, numerous news outlets noted where he ended his days: Little Saigon, located in Westminster, Orange County, the same town where Mayor Ta won election. Living his life out in a federally subsidized Santa Ana apartment, Thien spent his final years lecturing, writing, and broadcasting political shows for Vietnamese language radio and television throughout the U.S. Thien was made famous for his book of poems, “Flowers from Hell,” written while languishing in Vietnamese jails, including the infamous Hanoi Hilton, for 27 years before being allowed to leave Vietnam for the U.S. in 1995. His life, in many ways, represents how Orange County came to its current incarnation: the anti-communist rhetoric that argued for intervention in Vietnam, the military build up that Orange County and Southern California contributed to and benefited from, and the immigration changes driven by the war these two forces promoted, have remade the region. In the end, today’s Orange County remains connected to its past and the rest of Southern California in very clear ways. *NOTE: This sentence has be edited to revise a previously inaccurate set of data. 1 Lisa McGirr, Suburban Warriors: The Origins of the New American Right, Princeton: Princeton UP, 2001. 4 Ann Markusen et al, The Rise of the Gunbelt: The Military Remapping of Industrial America, (New York: Oxford University Press, 1991), 16 – 19, 42. 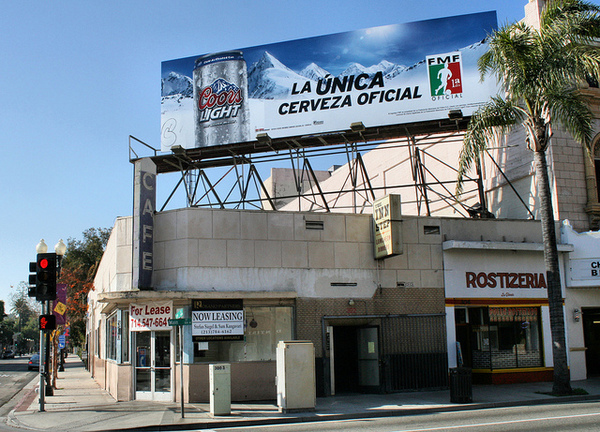 This article appeared originally on the KCET Departures website under the Intersections column.